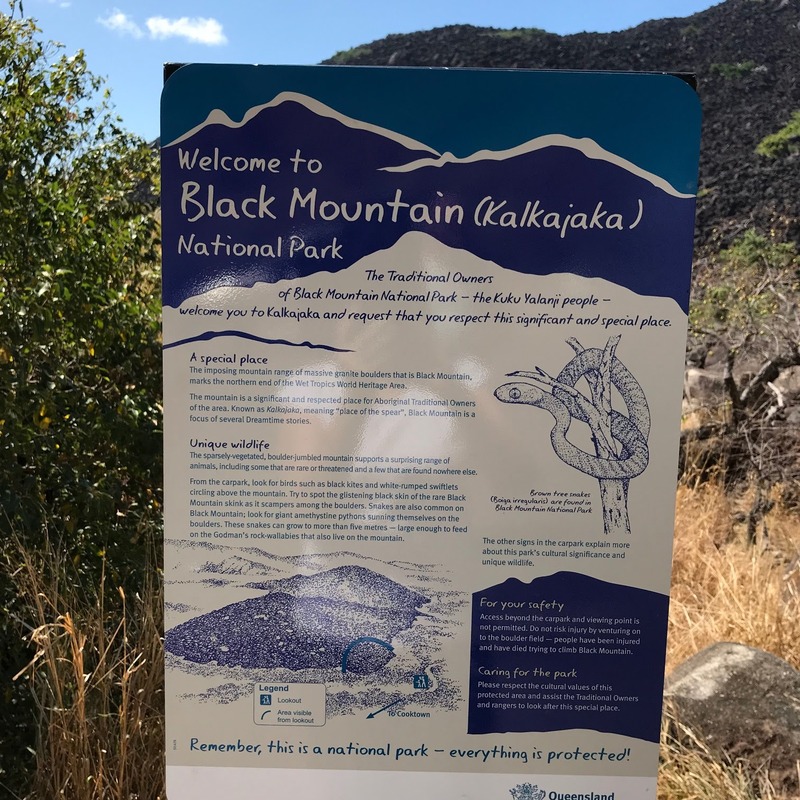 25km south of Cooktown, in northern Queensland, is an area known to the local Aboriginals as Kalkajaka: “place of the spear”. 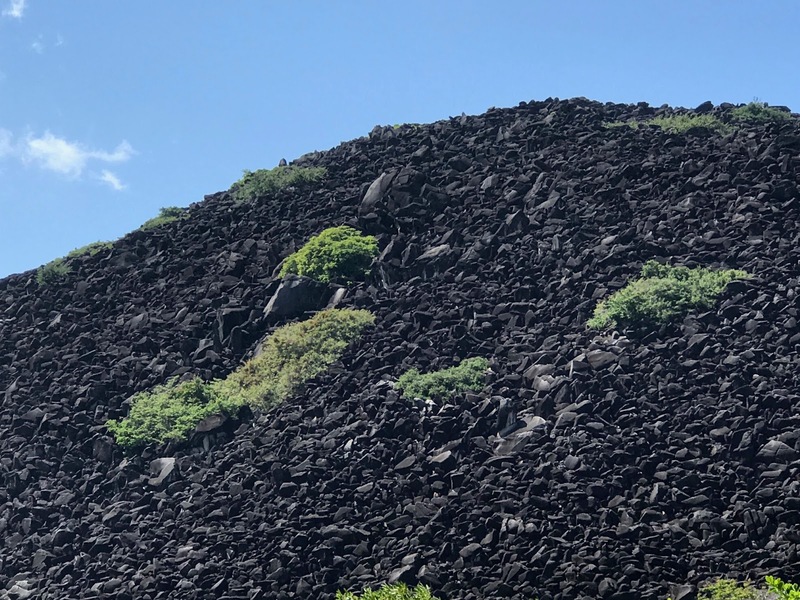 More commonly, it is referred to as Black Mountain, a name that is very apt. 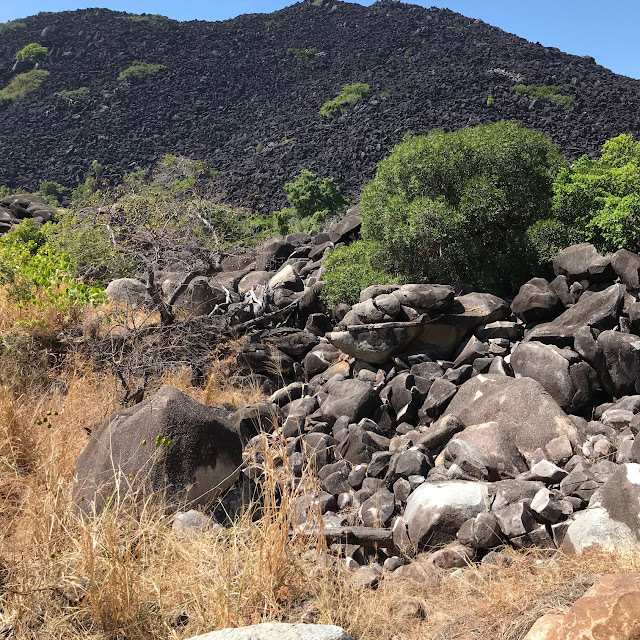 The mountain is made up of hard, granite boulders that formed out of magma around 250 million years ago, according to scientists. 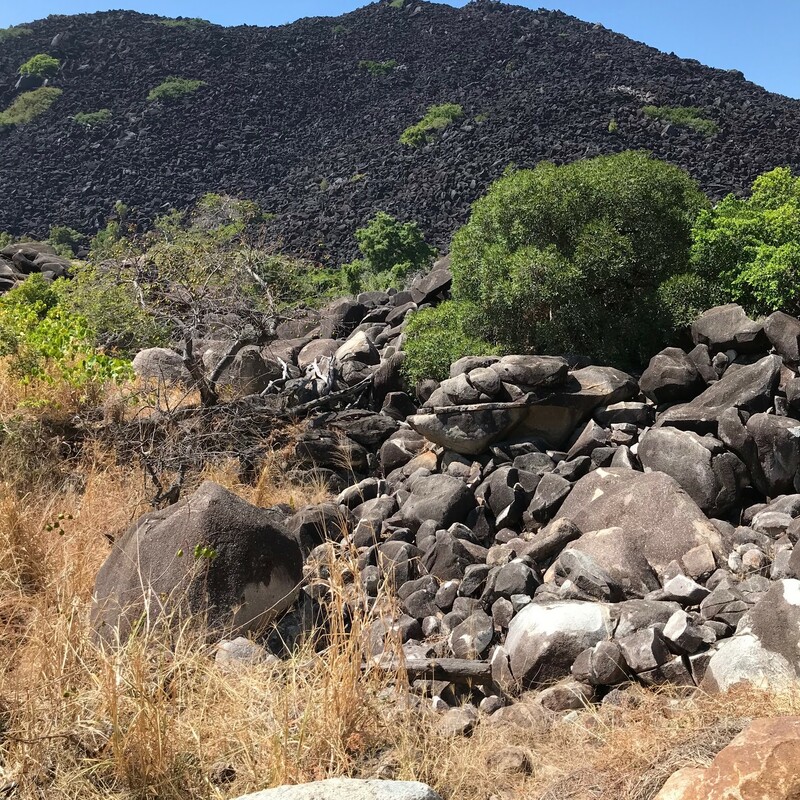 While it is commonly reported that the rocks are black, they are in fact a light grey; the darker colour is actually caused by a a thin layer of lichens that grows there. It is also a place where many people – and the people searching for them – have mysteriously disappeared. According to Wikipedia, Kalkajaka is the site of several places of significance to the Kuku Nyungkal people native to the area. In particular, there is Kambi, a cave that is home to flying-foxes; Jalbanu, a kangaroo-shaped rock; Birmba, an area that hosts sulphur-crested cockatoos; and Yirrmbal, a forbidden place at the foot of the mountains. It is also supposed to be the home of a mysterious beast called the “Queensland tiger”, who is supposedly responsible for the death of a lot of cattle in the Cooktown area. The boulders that make up Black Mountain are a jumbled mess that look like someone just dumped them there. They are devoid of any dirt or soil, and the haphazard manner in which the stones lie creates a network of tunnels and caves that lead deep into the earth. Aboriginal legends tell of a wicked medicine man known as the Eater of Flesh who, as the name suggests, ate people. One day, he ate a young tribal leader but was caught and attacked by the rest of the tribe. The Eater of Flesh cast a spell and turned into a giant python / goanna (legends vary) before escaping back to Black Mountain. Ever since, the Eater of Flesh only emerges to feast on those who venture near. Another legend tells of a time during the Dreaming, when a beautiful young maiden drew the attention of two warriors. To determine who would get the maiden, the warriors decided to build a mountain of rocks each – whoever had the highest mountain would win over the maiden. Before they could finish, though, a storm passed through the area and caused the mountains to collapse, burying both the warriors and the maiden. It is said that the cries of the maiden can still be heard there today. The first stories from white settlers begins in 1877. A Mr. Grayner, a local courier, went out to the mountain looking for a lost calf. When he didn’t return, others went searching for him but he, the calf, and the horse he rode out on were never found. A few years later, a wanted criminal and his accomplices fled into the mountain to hide from local police. They were never seen again, despite a thorough search. The next disappearance occurred about thirteen years later. Similar to the above, the local law enforcement tracked a fugitive to the mountain and came to the entrance of a cave. One Constable Ryan reportedly entered the cave. Neither the fugitive nor the constable were seen again. One of the more unusual reports comes some time after that. A local man named Harry Owens went looking around the mountain for some missing cattle. When he didn’t return, his friend, George Hawkins, reported him missing and went out looking for him. When Mr. Hawkins also vanished, the police launched an investigation. 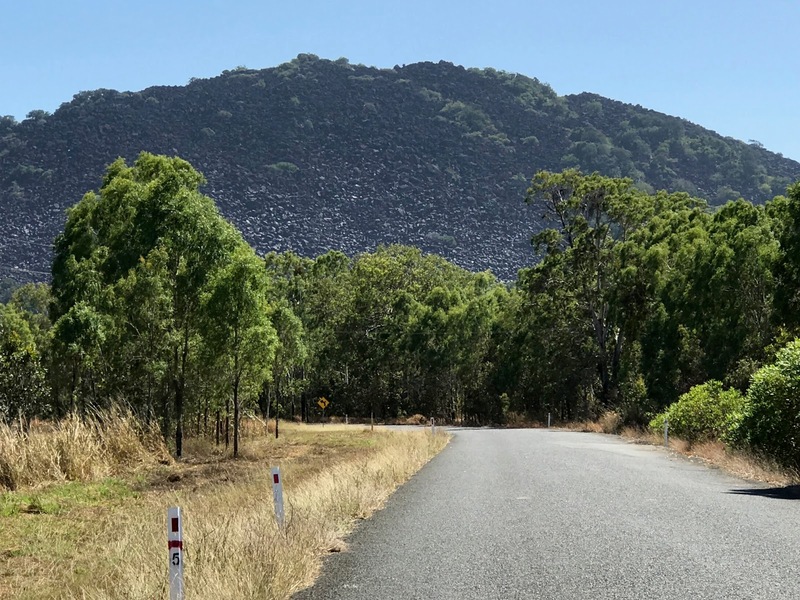 Two officers entered the caves of Black Mountain to search for the missing men – only one emerged, but he was completely unhinged and terrified of his experience and couldn’t give a coherent report of what had occurred. These weren’t the only people to go missing. Two cave explorers went missing in the 1920s while investigating the mysteries of Black Mountain. In 1932, a backpacker vanished near Black Mountain, though his body turned up later. He had died of unknown causes. In modern times, pilots who fly over the area report malfunctioning equipment. In fact, so many of these reports came forward that tests were done to determine what could be causing this phenomenon. No conclusion was found, however. 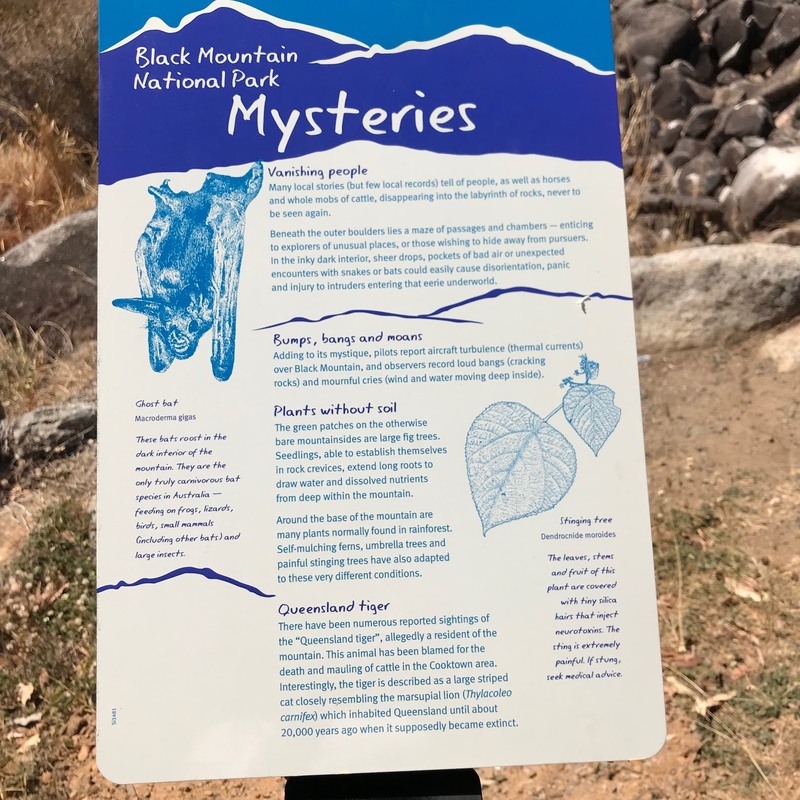 More recently, a couple of European explorers named Ivan and Danny Mackerle decided to try and find out what was going on at Black Mountain. They camped at the nearby Lion Den campsite and then, following a dry river bed, hiked to the mountain itself. As night fell, they made camp at the base of the peak. As they sat in their tent and chatted, they noticed that the sounds of night animals had abruptly stopped. Then, they heard sounds of rock scraping on rock, followed by footsteps in the bush around them, which they decided couldn’t have been caused by any animal. As the footsteps got closer to the tent, they jumped out, torches shining into the bush around them. But all was still, and there was no one nearby. In the morning, the two men decided to enter Black Mountain. They picked one of the numerous cave openings and entered, taking all precautions necessary. Inside, they found a twisting labyrinth of tunnels and chambers and encountered large bats. At one point, a boulder fell out from beneath Ivan and if it hadn’t have been for the rope he was gripping, he would have plummeted down a shaft. Ultimately, though, the explorers could not find their way deep into Black Mountain and returned to the outside. Recent legends have stated that Black Mountain is not natural – despite what scientists have said – and is instead a UFO base. Others believe it is home to an underground race of reptilian humanoids. Still others think that at the heart of Black Mountain lies a treasure of unimaginable value. Tales of crying or howling noises, explosions, and mysterious lights at the mountain persist. Recently, my parents, who were travelling in the area, went to Black Mountain and, at my request, took many of the photos you see in this story. They reported hearing a “howling” noise coming from the mountain, but stated that it was windy on the day and that it could have been the wind blowing through the tunnels. So what is the truth about this mysterious place? Is it haunted by demons, such as the Eater of Flesh? Or is it just a dangerous, treacherous place due to the nature of how the boulders are stacked? What lies at the heart of Black Mountain? Treasure? Aliens? Reptilian humanoids? Perhaps we will never know. In fact, it is quite possible that the legends of the missing people are just that – legends – as finding documented evidence of these occurrences is difficult. But the legends persist, and with record keeping being sketchy during those times, there is every possibility these tales are true.